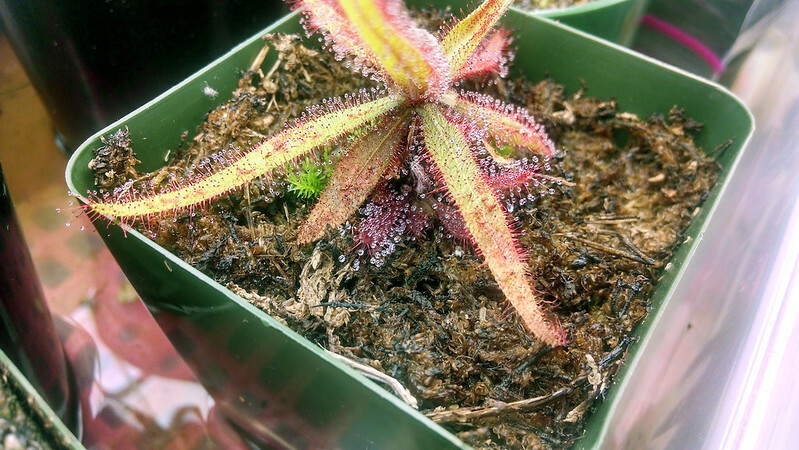 Plant Profile: Drosera adelae |Sundews Etc. 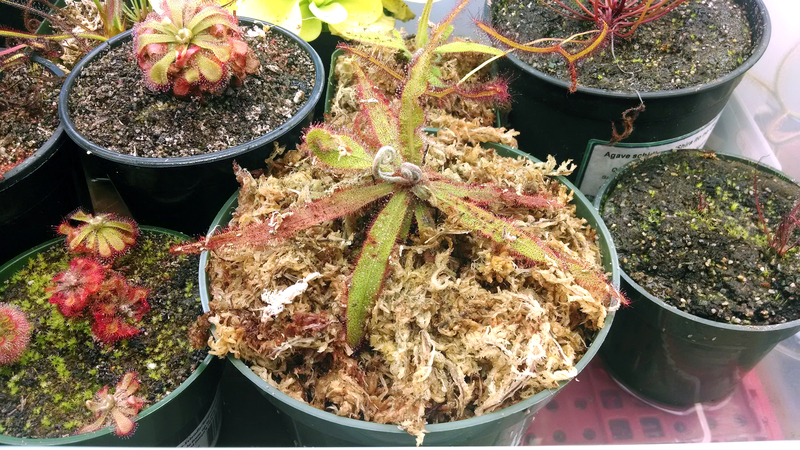 Drosera adelae is one of the most common sundews in cultivation, but well-grown specimens are among the most delightful plants a grower can have in their collection. The uniquely lanceolate leaves, wonderful color, and vigorous growth make it one of the first sundews I'd recommend acquiring. 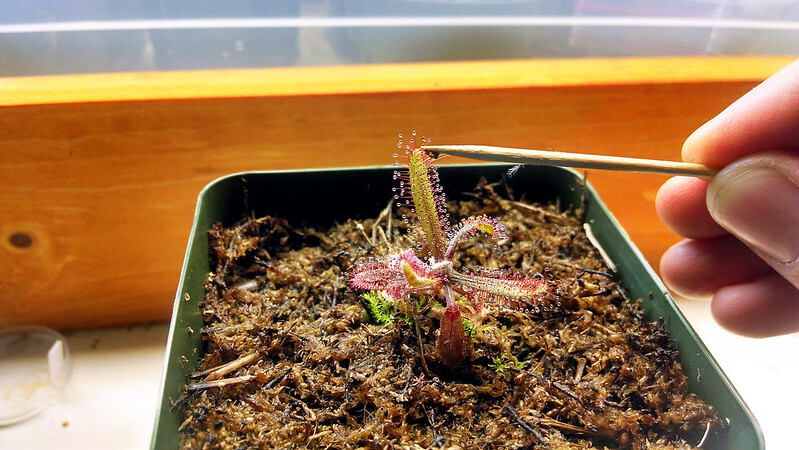 Much like Drosera capensis, D. adelae sometimes gets short shrift for being a beginner's plant, but I love beginner plants! 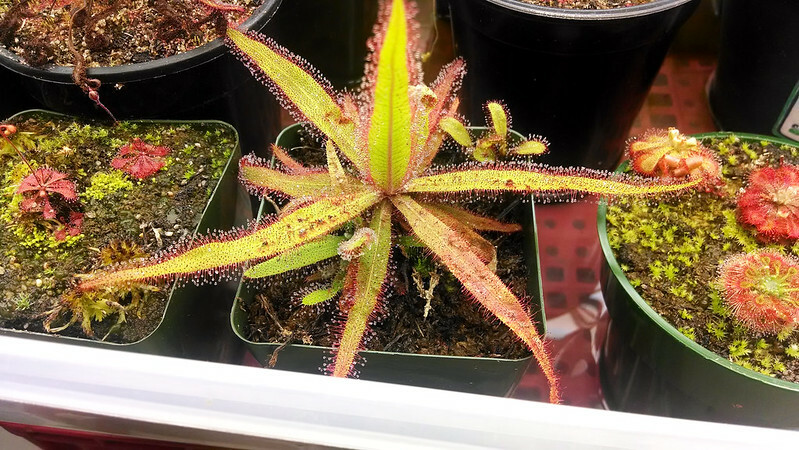 It's true this is one of the first sundews I acquired when building my collection, but it has continued to be one of my favorites. I received my little baby D. adelae from Natch Greyes back in March. No plant likes being shipped, and this one had one little leaf at first. But it perked up and started growing right away. It's wound up being one of the most vigorous plants in my collection, more so even than my D. capensis varieties. 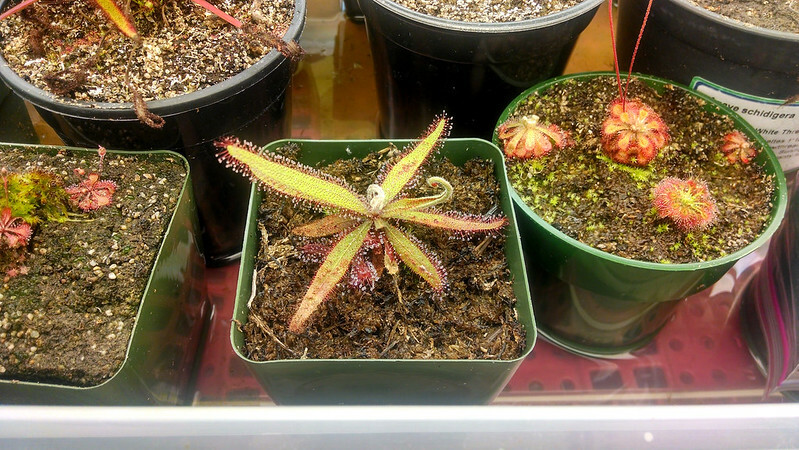 D. adelae is one of the Three Sisters of Queensland, along with Drosera prolifera and Drosera schizandra. This group of 3 closely-related species from Queensland, Australia grow in a wet, jungle environment that is quite different from the bogs where most sundews are found. 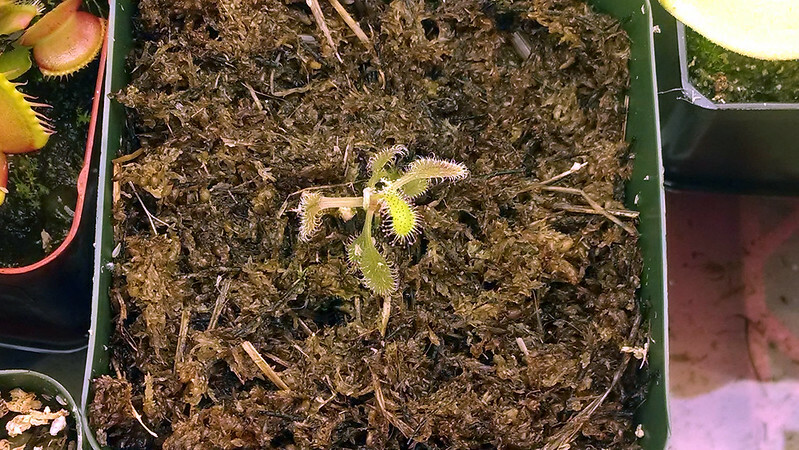 As a result these plants can tolerate (and D. schizandra requires) lower light levels than most other Drosera. In my opinion though, D. adelae grown in bright conditions looks much better than do specimens I've seen growing with less light. It has more red (mine would get very red indeed if I could resist feeding them so often) and is remarkably dewy. I grow mine in long-fiber sphagnum, sitting in the tray with the rest of my plants. The humidity is fine, but not particularly high, and temperatures range between 55 F and 85 F (12 C - 30 C). As the above pictures demonstrate, it grew from a small plantlet to a freely-offsetting mature plant within about 3 months. I feed it as often as I do my other plants (every 2-3 weeks) and it responds with lots of new leaves and long roots. I recently repotted it, sending 2 small plantlets off in a trade, and moving my largest plant into a big pot, while keeping another plantlet in one of my standard square pots. It looks a little ratty, like any recently-repotted plant will, but I'm looking forward to it getting even more free root run and continuing to multiply. media: Long-fiber sphagnum or living sphagnum are recommended, though my initial pot also involved some 1:1 peat:sand mix and the plant didn't really seem to mind. light: Can tolerate lower light. Leaves will be longer under lower light, but will lack much red color and have less dew. Very bright conditions make for a more upright, healthier plant. water: Use a tray and keep it wet. D. adelae is pretty tolerant of varying level of water as long as it doesn't dry out. temperature: Don't let it freeze. Tolerates higher temperatures as long as there is higher humidity as well. feeding: Feed regularly (every 2 weeks or so) for lots of growth. Regular feeding will keep the plant green, while less food means more red color. propagation: Offsets freely when mature and healthy. Also produced long roots suitable for cuttings. Leaf cuttings are also apparently very easy. Does not self-seed – requires a genetically different plant for fertilization.